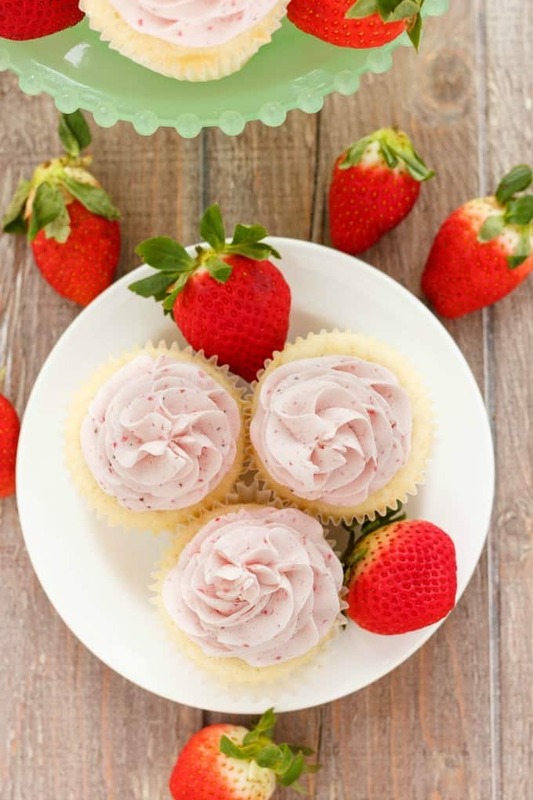 The photos and recipe for these lemon cupcakes with strawberry Swiss meringue buttercream have been updated as of February 28th, 2016! Spring is in the air, but summer is just around the corner. Our temperatures here in Canada have been relatively mild compared to our previous summers. Not complaining, as I do prefer cooler temperatures. However, these nice temperatures have made it the perfect wedding cake weather, as we all know icings don’t take too well to the heat. Ever since I tried Swiss meringue buttercream, I have had a hard time going back to regular buttercream. The only time I have made American buttercream since trying SMB is for children’s cakes because they prefer the overly sugary taste as opposed to the buttery taste of Swiss meringue buttercream. Personally, I love the silky, smooth quality of SMB. It is easy to work with and, if you are quick enough, you won’t have to worry about warming the icing up in your hands too much (resulting in frosting that is hard to work with.) The taste is unbelievable, but you have to make sure you flavour it properly or it will have a buttery quality about it. Ever since my first time experimenting with Swiss meringue buttercream, I have been looking at different flavour combinations to add to the icing. Today’s latest: Lemon cupcakes with strawberry Swiss meringue buttercream! The SMB was topped onto lemon cupcakes, my adaption of a vanilla cake recipe that has served me well. I was really pleased with the results. 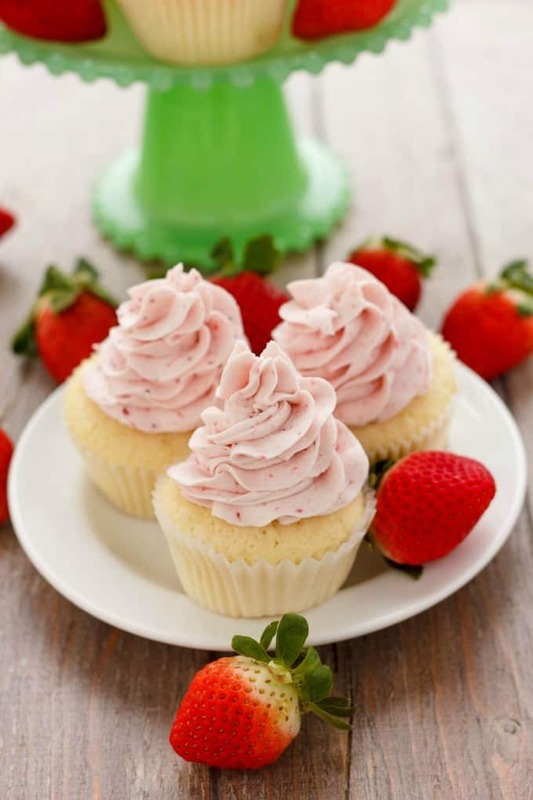 Lemon and strawberry pair perfectly together, and I knew with the smooth taste of the Swiss meringue buttercream there would be no worries of one flavour overpowering the other. 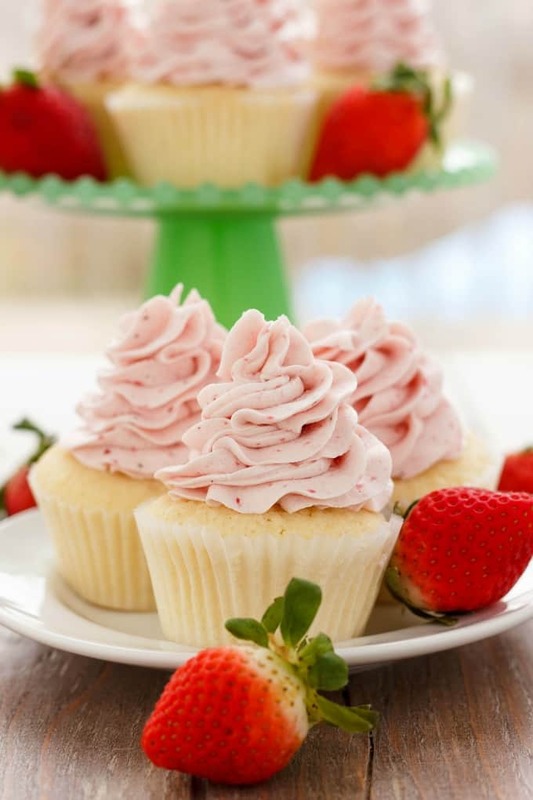 A refreshing summer lemon cupcake topped with strawberry Swiss meringue buttercream. In the bowl of a stand mixer, add the butter, lemon zest, and sugar. Beat until light and fluffy, about 5 min. Beat in the eggs one at a time, making sure to combine well before adding the next. Add vanilla and almond extract and mix well. Sift together the flours, baking powder, and salt. In a measuring cup, combine the whipping cream, milk, and lemon juice. With the mixer on low, add in the flour mixture and milk mixture alternatively, always starting and ending with the dry ingredients. I usually work in 1/2 cup flour mixture and 1/8 to 1/4 cup liquid alternatively. Mix until just combined. Line a cupcake tray with cupcake liners. Fill the liners with batter, about 2/3 of the way full. You should get 12 cupcakes total. Place tray into the oven and bake for 15-18 minutes, or until toothpick comes out clean. Allow to cool slightly in tray and then move cupcakes to wire rack to finish cooling. Decorate with desired icing. To make the strawberry Swiss meringue buttercream, please follow my tutorial here and add in the strawberry puree after all the other steps have been completed! Make sure to replace the original vanilla amount with the details listed above! 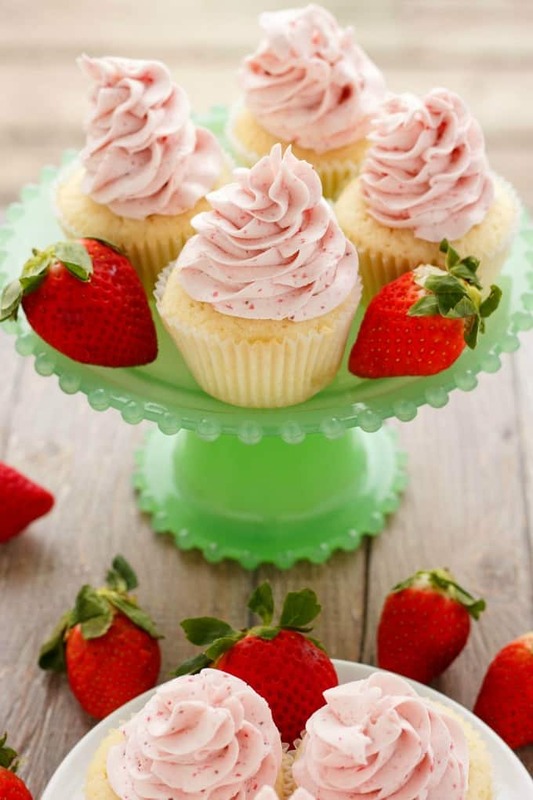 For the SMB, I followed my basic Swiss meringue buttercream recipe and stirred in 3/4 – 1 cup of fresh strawberry puree into HALF the batch of icing. 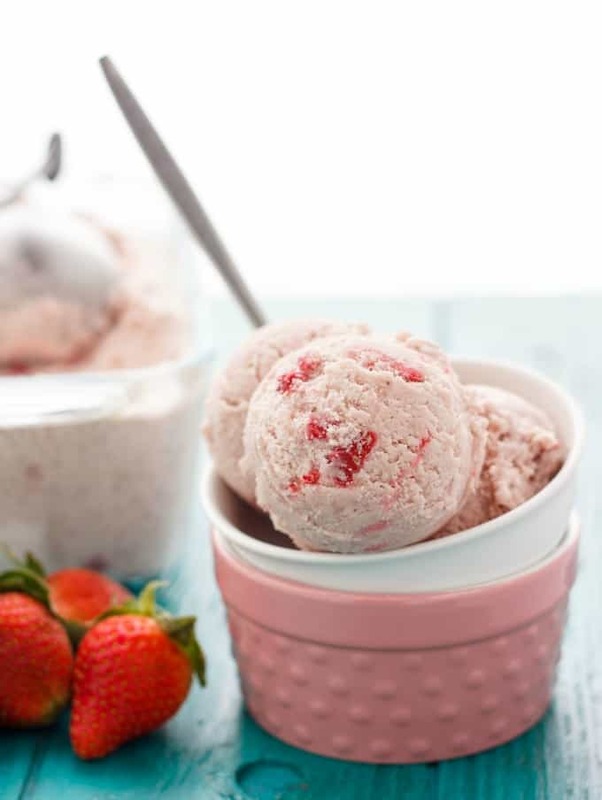 Just combine some strawberries into the blender (I think I used about 1/2 lb, but you can add more or less as desired) and sprinkle with a fresh squeeze of lemon juice and sugar (if desired.) Personally, I just pureed my strawberries and left them as is. They were not sour, but perfect (strawberry season!) The reason I only put puree into half the icing? I only made a small batch of cupcakes (the 12 listed above) and definitely did not need a full batch of icing, so I placed the rest into a Tupperware container and stored it for later use. My advice? 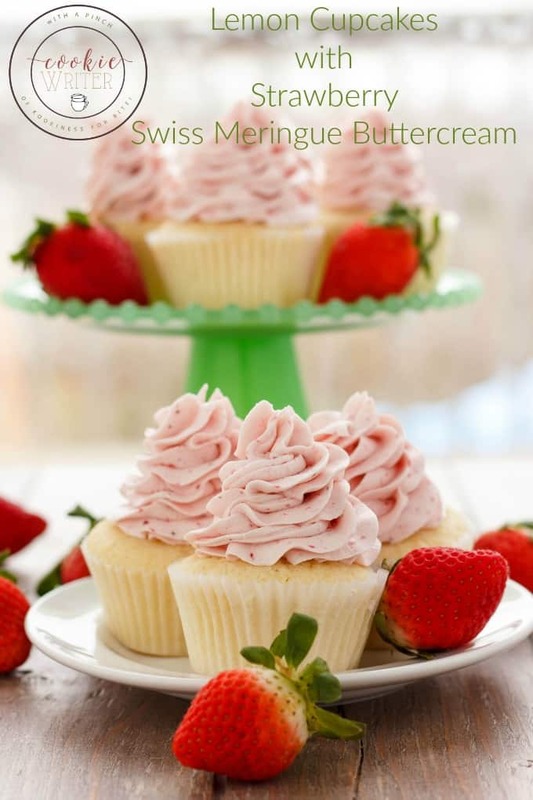 Remove half the Swiss meringue buttercream and mix in 1/4 cup of strawberry puree at a time. Taste. If you want more, add more. Otherwise, you are good to go! For the lemon cupcake recipe, I have to say, this is one of the softest, moistest vanilla base cakes yet! I am always playing around with the original vanilla cake recipe to see what I can come up with, and this one is at the top of my list! I cannot wait to work with it again and see where I can take it. the butte rcream looks lovely!